If you wear dentures or are considering a denture appliance to restore your smile and replace missing teeth, we can offer an implant retained denture appliance to ensure stability. 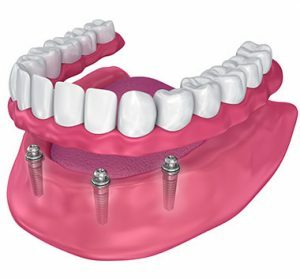 An implant retained denture allows you to wear your appliance with confidence as it clips into place, giving you a stable and solid foundation. At Broseley Dental Practice, our dentists offer the expertise and knowledge required to improve and enhance your denture appliance and eliminate the worry of it rubbing against your gums or moving around in the mouth. This restorative procedure entails a number of titanium implants being embedded into the jaw bone. These act as ‘roots’ or anchors for your denture appliance which clips onto them and is held firmly in place. We will take impressions of your teeth so that our laboratory team can build your bespoke denture. Following the implant procedure and a period of healing, we will then show you how to clip the denture into place. Just like a traditional denture, an implant retained device is removable and easy to care for. Before we can progress with this treatment we will need to ensure that your jaw bone can hold the titanium implants and carefully plan each step of the treatment.